Whether they’re escaping the bitter cold of winter or looking for some relief from the blistering summer sun, rodents, bugs, and other pests always see your home as a safe shelter. And while it’s bad enough to find you have mice living in your garage, it’s even worse to find pests living in your walls, literally. If you have wood siding, you’re susceptible to an infestation, so you need to know how to handle pests in your siding. This is a given — where there is wood, there can be termites. While these pests will often eat the wood below ground levels, once they’ve munched their way through that, they can create tunnel-like holes in your wood siding, damaging the wood’s structure and integrity. These buzzy bees will tunnel into your wood siding to create nests for themselves — and will keep doing so year after year unless the nests are closed. If you notice them in your wood siding, use caulk to seal up the nest holes and tell those bees they aren’t welcome in your home. 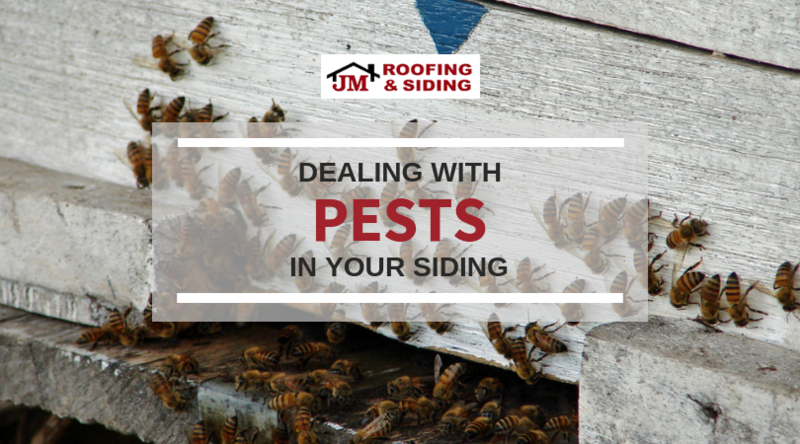 While these flying pests typically stick to the inner walls of your home, if any of your wood siding is very moist or rotting, they’ll make their way there. A tell-tale sign that you have a carpenter ant problem is small piles of wood shavings by your walls. If clogged gutters allow water to flow onto your wood siding, that extra moisture can rot the wood and attract pests. Keep your gutters clean to avoid this issue. The more wood, the more snacks for those bees and ants. Keep your firewood farther away from your home. If you just can’t seem to keep pests away from your wood siding, consider switching to vinyl, aluminum, or fiber cement siding. These materials don’t attract pests as much as wood siding, so they may help solve your problems.